Any Carl Sagan fan knows you’re made of star stuff. Protons don’t decay into any other particles (as far as we can tell), so you can reliably assume that most bits of you have been around since a second after the Big Bang. But if you’re thinking a little more locally, you might wonder whether the Milky Way formed in its entirety before little ol’ you were made. It turns out that, if new estimates are right, half of the atoms in our galaxy could have been stolen from other galaxies. The new analysis, from a team of astrophysicists from the United States and Canada, shows that galaxy formation (and the formation of stuff in general) is a complex give-and-take process. 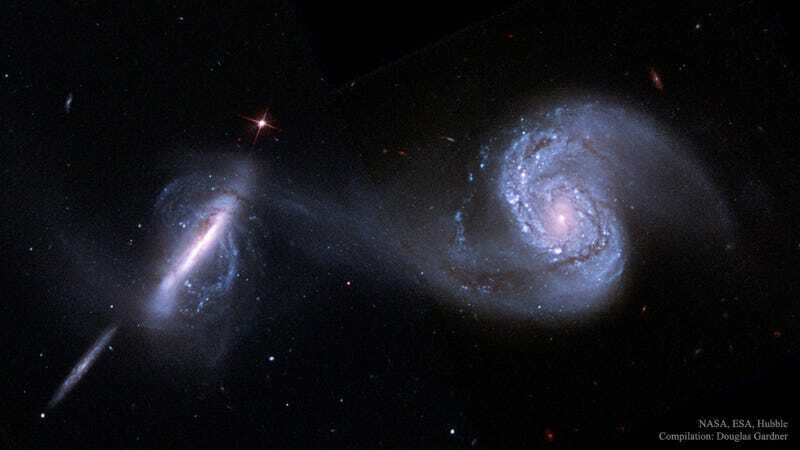 “Overall, our results highlight the role of galactic winds as a primary contributor to the baryonic mass budget of central galaxies,” the authors write in the paper, published today in the Monthly Notices of the Royal Astronomical Society. The Milky Way is only a few hundred million years younger than the universe itself, and formed as the initial hot gas in the early universe clumped. The new paper shows that in a simulation, fifty percent of a galaxy like our Milky Way today comprises of stuff ejected from other galaxies more recently than that. “The question of how much of the Milky Way’s stars were built up “in place”, versus acquired from other sources, “has always been an intriguing one,” astrophysicist Dylan Nelson from the Max Planck Institute for Astrophysics in Germany told Gizmodo in an email. The authors cite papers as far back as 2003 describing the importance of the exchange of matter in galaxy formation, but including it in models has been quite difficult due to certain smaller-scale physical complexities. But a simulation called Feedback In Realistic Environments (FIRE) helped these researchers come up with a way to model the behavior of gasses in and between galaxies. Our thieving Milky Way stole a bunch of stars from unsuspecting galaxies—and it feels no remorse. The researchers took into account things like star formation, supernovae, stellar winds, and other factors to model galaxies and their galactic winds. Their simulation then put a main galaxy in the center of others, and played the system in reverse. After lots of number crunching and supercomputing, the researchers found that only 50 percent or so of the stuff in a Milky Way-type galaxy at present came from internal processes, like star formation and sucking up previously-ejected galactic winds. The rest came from other galaxies. Of course, this was just a simulation. But at least one outside researcher, Jessica Werk at the University of Washington in Seattle, told New Scientist that the work included “one of the best simulations.” She pointed out that understanding where the atoms in the Milky Way come from is an important topic in astrophysics. And who knows, maybe in a few billion years time, someone else’s body will be made out of your atoms. That would be nice.